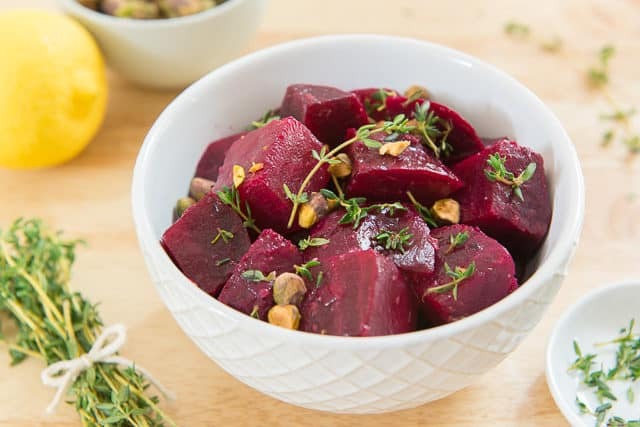 Simple yet full of flavor, these Roasted Beets are a healthy side or snack to make and keep on hand in the fridge. 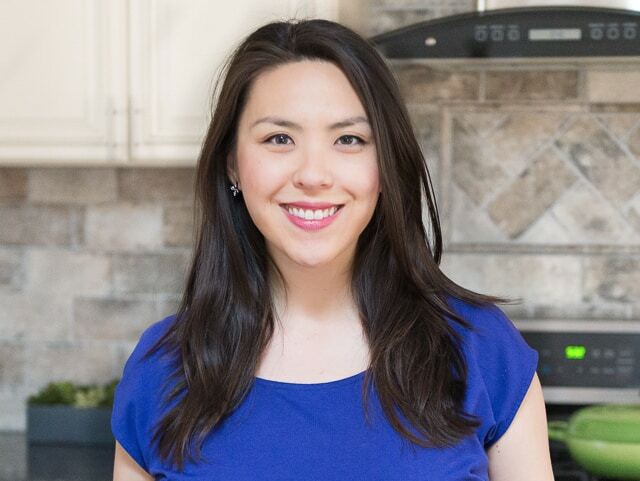 They’re nutritious and delicious, and friendly to Whole30, paleo, gluten-free, vegan, and many other types of eating styles. I always feel like I’m getting away with something when I eat beets, because they’re so sweet and flavorful, and yet they’re technically a vegetable. That’s winning right there. When people say they hate beets, I often wonder if they’ve only had canned beets. 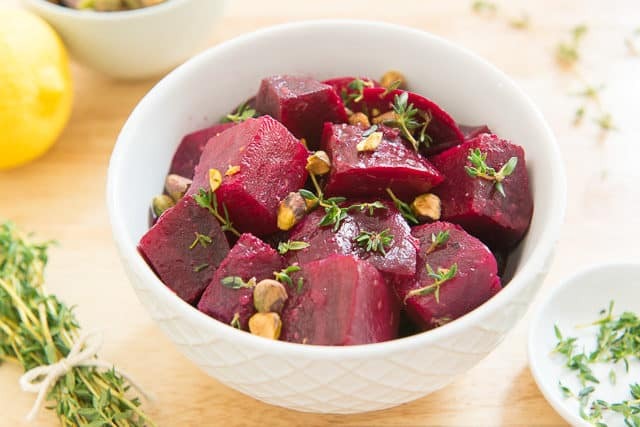 Roasting fresh beets intensifies their wonderful flavor and brings out their sweetness. They’re always a pleasure to eat like this. 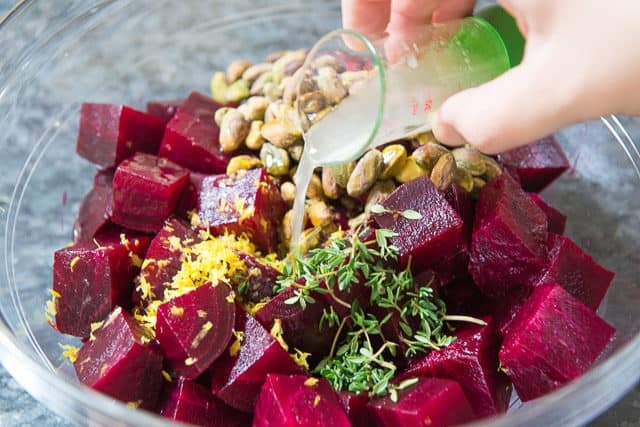 This particular preparation is quite simple, as beets don’t need a lot of help. We’re going to add a few simple flavors like fresh thyme, fresh lemon juice and zest, and some pistachios for crunch. While you can buy pre-cooked beets from the store, they’re very expensive, and cooking them yourself is easy. My favorite method is to roast them in the oven. Wash the beets, then wrap individually in aluminum foil. Roast the beets for about 45 minutes, then let them cool to the touch. After that, peeling them is a total piece of cake. Just rub the skin off with your fingers, or use a knife to scrape it off. 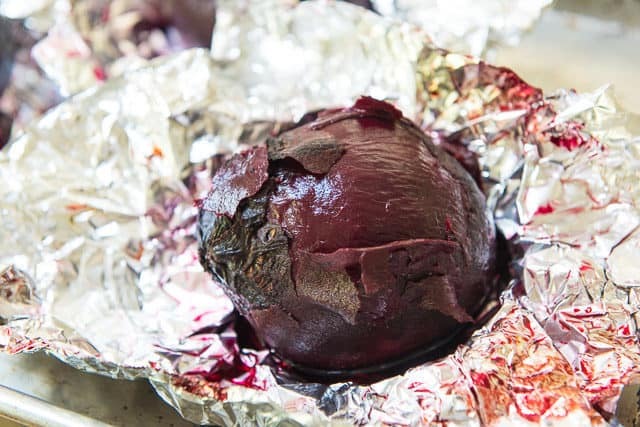 FYI: Wrapping the beets in foil is very important to keep the beets moist and make the skins easy to peel. I discovered this once when I didn’t have any foil on hand, and the skin was crackly, brittle, and so hard to peel. This would be a really great side to my 15-minute Parmesan Crusted Chicken, or Chicken Roulade with Sundried Tomato Pesto. Also try these Beet & Goat Cheese Napoleons, which is more complex to make but a total showstopper. For another veggie side, these Roasted Parsnips are so good (I love parsnips). Can you eat the skin on roasted beets? Yes you can (assuming you scrubbed the dirt off before cooking). It all depends on if you want the texture. The only time I have eaten beet skin and enjoyed it was when the beets were smashed and fried like Crispy Smashed Potatoes. Can you freeze beets? Yes, but make sure to cook them first, either by roasting or boiling. 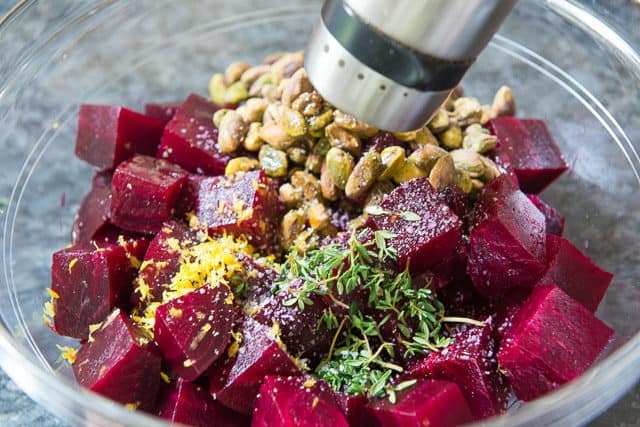 How long will roasted beets keep in the refrigerator? About 4-5 days in my experience. 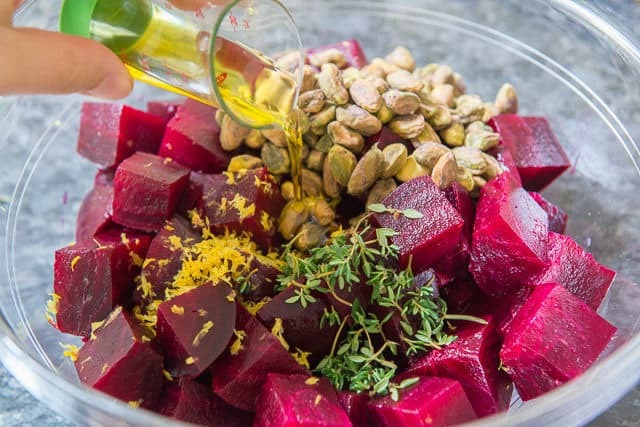 How to tell when roasted beets are done? Beets vary quite a bit in size, but it usually takes 45-60 minutes to fully roast beets in a 375F oven. 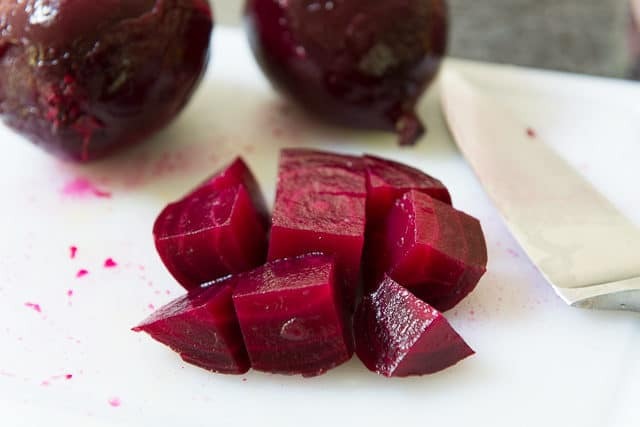 When done, inserting a paring knife into the center of a cooked beet should be easy. 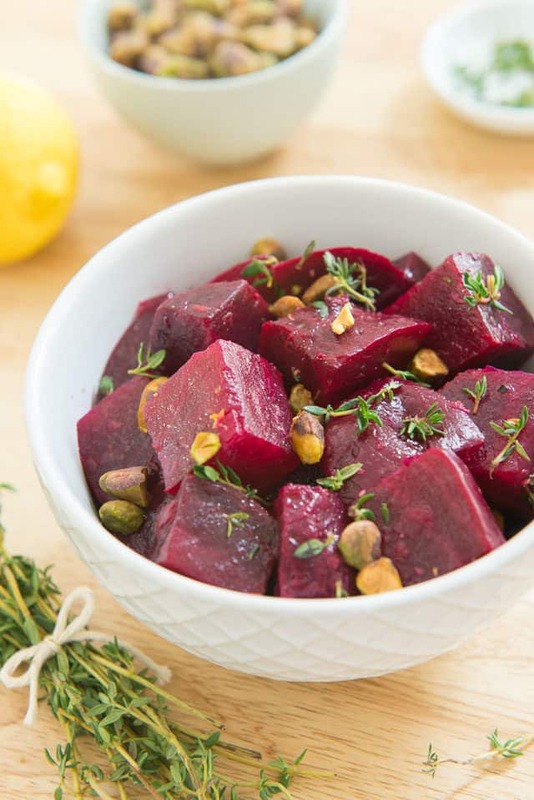 Simple yet full of flavor, these Lemon Thyme Roasted Beets are a healthy side or snack to make and keep on hand in the fridge. Wash any dirt off the beets, then individually wrap in aluminum foil. 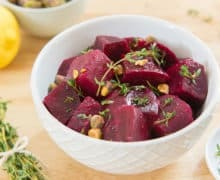 Place on a baking pan and roast for 45 minutes, until a paring knife inserts easily into the center of the largest of the beets. Let the beets cool for 10 minutes, or until cool enough to handle with your hands, and peel the skin off. Cut the beets into bite-sized chunks (I like the pieces about 1" big), and place into a bowl. Add the lemon zest, lemon juice, thyme leaves, olive oil, salt, and pepper, and stir to combine. Add the pistachios just before serving, as they will get soggy after an hour or so. Enjoy! If you expect to have leftovers, hold back some of the pistachios, as they will get soggy when stored for long periods of time. Stir in pistachios right before eating. Leftovers will keep for 4 days. This would be a really great side for my 15-minute Parmesan Crusted Chicken, or Chicken Roulade with Sundried Tomato Pesto. This recipe looks good. I always like to have a few new ways of preparing favorite vegetables. Especially now that the fall vegetables are starting to come in. I’m going shopping tomorrow and I am getting fresh beets. My mother served beets to us when we were children. The only way she fixed them was “Harvard beets”. A sweet & sour sauce made with vinegar and sugar. Got tired of them, but this way of preparing them sounds tasty. Can’t wait. Will let you know how they turn out. Patt. What a lovely and simple way to prepare beets. Will make again!